In April (this took awhile to finish and still feels unfinished), I had the opportunity to have a glass of wine and chat with Mary Stubbs of Stubbs Vineyard at her home far above the vineyard. Mary is a friendly, intelligent, lively Marinite with passions for the organic movement, the environment, wine, art, and her family. Mary is steeped in knowledge from her winemaker, Don Goldfield, and her former vineyard manager Mark Pasternak. She grew up in Mill Valley and graduated from Tam High. After working in San Francisco and falling in love, Mary and her husband bought this ranch in West Marin in the 1980s. They have two sons and a daughter. 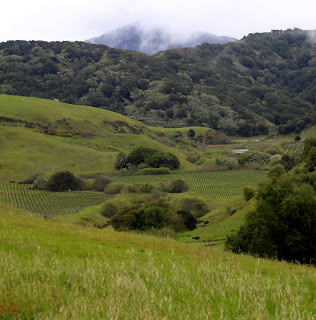 In 1996, after taking some courses on vineyards and figuring out which clones would be best for their soil and microclimate, Tom and Mary planted 6.4 acres of Pinot Noir and 4.6 acres of Chardonnay.